We’ve done some comparisons, and as it turns out, bees are a lot like little kids. Both cannot seem to stop moving from place to place. Both like bright colors. Both can lash out when they’re a bit agitated. And of course, both have a sweet tooth! If you have a sugary treat sitting out you'll be sure to attract both buzzing bees and curious little children. That’s why it’s a good thing that Halloween happens in the fall, when the bee populations aren’t so boisterous. All the candy would surely cause a stir! 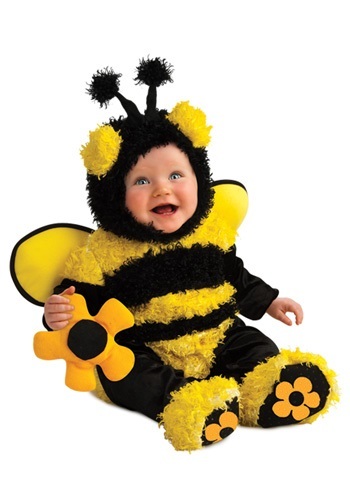 Now, you can let your little one become one with their inner bug in this fuzzy Infant Buzzy Bee Costume. You can fly her around the neighborhood, imagining each house is a fanciful flower full of sweet nectar. Of course, she’s not old enough to eat all of that trick-or-treat “nectar,” but she doesn’t need to know that now; she’s awash in her sweet buzzing fantasies. And you’ll be all abuzz, too, about the adorable photos you’ve taken of your little bumble bee, all cozy in this striped, furry jumpsuit. The soles of this costume are anti-slip (they thought of everything!) so she can wobble around with ease, and the wings...well...the wings are just too freaking cute. She’s the queen bee of your eye, and now you’ve got the outfit to prove it!